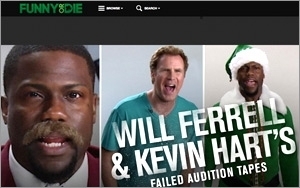 Humor hub Funny or Die is adding new ways to monetize its content and advertiser buys through a partnership with interactive video tech firm Multipop, a platform that allows publishers and marketers to transform their video with interactive content without disrupting the viewing experience. Funny or Die will use Multipop’s video platform to expand its advertising and brand integration opportunities, enabling more high-visibility placements for its ad partners, the partners said. Multipop’s platform allows publishers to integrate interactive features including e-commerce tie-ins, social sharing, and nonintrusive advertising options, all of which can be integrated with the main video player in a variety of formats. It also enables features like voting, simultaneous Web surfing and viewing, and organically integrated content extensions. Previously, Multipop launched a new integrated player enables users to incorporate the company’s technology anywhere the original video is embedded, including YouTube, Vimeo, or their own proprietary player, all through a self-service interface. The Multipop platform also collects data that allows marketers and content creators to tailor their strategies, including what devices, operating systems and browsers viewers are using, their demographic characteristics, and affinity categories, among other types of information.